"Merle Falor, 82, of Mitchell, died Tuesday, August 21, 2007 at Prairie Crossings in Mitchell after a lengthy illness with lung cancer. Funeral services will be 10:30 am Friday at Holy Family Catholic Church. Burial will be in Calvary Cemetery. Visitation will be Thursday 6-8:00 pm with a scripture service at 7:00 pm at the Bittner Funeral Chapel. 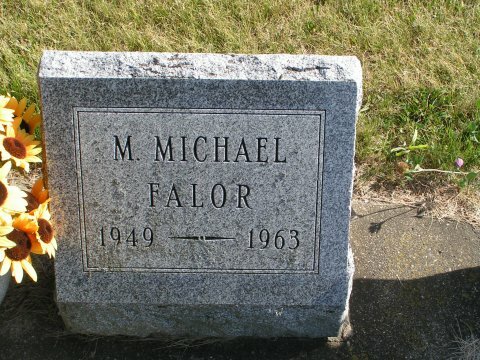 He was born August 25, 1924 at Kimball, SD to Sylvester and Ethel (Briggs) Falor. He grew up attending country schools at Wilbur Township, Backes School and Torry Lake and graduated from White Lake High School in 1942. On December 27, 1947 he married Berniece Schmitt at Kimball. They farmed in the Kimball and White Lake area and then he worked as custodian at the White Lake School. In 1970 they moved to Presho where he was involved in ranching until 1976, then went to work for the South Dakota State Highway Department retiring in 1990. He had utilized his carpentry skills to tear down a church in White Lake to build a house and tore down an old house in Presho to build a house there. In 1994 they moved to Mitchell. He enjoyed playing cards and really liked “winning”. He was a member of Holy Family Catholic Church and the Knights of Columbus. He is survived by his wife Berniece, one daughter, Donna Cannon and husband Jim of Sioux Falls; one son, Douglas Falor of Salt Lake City, UT; one brother, Edwin Falor and wife Joan of Platte; two grandchildren, Patrick and Christina “Tina” and one great granddaughter, Caryn. He was preceded in death by his parents, one sister, Dorothy Kegel, and two brothers, Wayne and Harold. Memorials are preferred in lieu of flowers"
Family Tombstone* January 1997 Rosemary Smith; East Plains Cemetery, Clinton County, MI, USA ; Between Hubbardston and Pewamo. 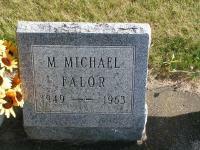 Merlin Michael Falor's Headstone at the East Plains Cemetery Clinton Co. Michigan. (Witness) History May 2012 Michael D. Falor, 59, of Auburn, passed away on Saturday, May 26, 2012. He was born on June 11, 1952 in Santa Rosa, CA and grew up in Winlock, WA. Mr. Falor was self-employed as an auto mechanic, most recently worked for Browns Super Service. He enjoyed building and racing stock cars and traveling. Michael married Stacie Thompson on March 23, 1979, she survives. Other survivors include a daughter, Sam (Chris) Dull; two grandsons, Ashton and Colton Dull; two brothers, Fred (Tina) Falor and Burke (Chris) Falor; three sisters, Sharon (Russ) Glasier, Darlene Wood, and Mable McDaniel; and mother-in-law, Patty Thompson; two sister-in-laws, Sally (Bob) Marshall and Jane (Tim) Stangl; and many special nieces and nephews. 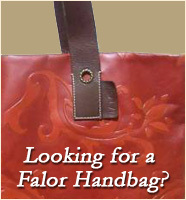 He was preceded in death by his mother, Lucille Falor; a brother, Kenneth Falor; a sister, Roberta Bostwick. A visitation will be held from 5:00 7:00 p.m., Tuesday, May 29, at the Penwell-Gabel Southwest Chapel, 3700 Wanamaker Rd., Topeka. Burial will follow at Oak Grove Cemetery in Missouri Valley, IA, at a later date.